Nov. 24, 2014: Bombardier CSeries flight testing has now passed 500 flight hours, and with the addition of Flight Test Vehicle 5 to the test fleet soon, the head of the program believes BBD can hit its entry-into-service target of 2H2015. 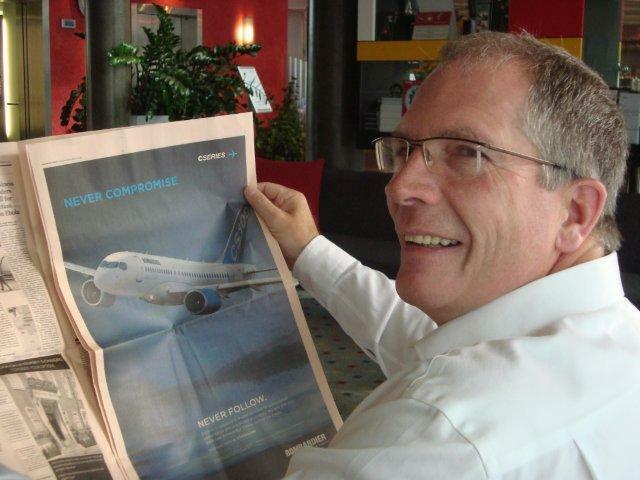 Rob Dewar, VP-GM Bombardier CSeries. Source: Fliegerfaust. Robert Dewar, VP and GM of CSeries, declined to affirm, or even confirm, a report that EIS now has an internal target of October 2015. In a wide-ranging interview November 24 with Leeham News and Comment, Dewar talked about the flight test program; the repairs to the composite wing of FTV1 following an engine failure that showered the wing with debris; the Fly By Wire software that’s been nettlesome; and other issues. October 2015 now target for Entry-in-Service, reports Canada’s Desjardins. Dewar reiterated the 2H 2015 target, which remains the company’s official statement. Bombardier now has a four test aircraft flying with the fifth joining the test fleet around Christmas time. The test aircraft has flown the full flight envelope with the Fly By Wires “normal” mode enabled. Right now the testing is concentrated on the FBW failure modes. The next important test series is performance with FTV4, which has production engines fitted for the purpose. FTV4 had just had its first flights when the FTV fleet was grounded for three months following the engine failure in May. The final assembly facility is finished with its tooling in July and the first aircraft to be assembled there, the second production aircraft, is presently in final assembly in the facility. Flight testing has now passed the 500 hour mark out of a total of 2400h planned. Speed is now picking up with the monthly utilization passing 35 hours. Bombardier reckons at a pace of about 40 hours average per aircraft (which will be a combined 200 hours per month after new year when FTV5 joins the test fleet), flight testing should be complete by autumn 2015, with certification and first delivery following directly after. Dewar was encouraged that the certification earned value actually tracks ahead of flown test hours due to the CIASTA ground testing system that has been in place and which parallels flight testing. CIASTA testing continued even as the FTV fleet was grounded. An important point is that FTV3, the lastest aircraft to be reintroduced into flight testing, could be loaded with the production version of the aircraft’s software (including maintenance functionality) with no additions or upgrades planned. This gives about 9-12 months of active usage of the production functionality before EIS. This shall give the CSeries a good shot at reaching an acceptable reliability at EIS. The other test aircraft will get this software release when there is a natural break in the test programs. The delay in getting the systems, including the fly-by-wire, to this status has been because the Bombardiers took its time to verify all system and their suppliers to the rigorous system integration standard ARP4751. Once such a verification has been accomplished, the gains are there, and it is easier to get the aircraft’s systems certified as the quality and tractability of all software code is guaranteed. The test aircraft are presently flying with an interim fix to the oil loss problem that was traced to an incorrectly functioning aft bearing box. This bearing box has a special design to to contain the oil that lubricates the aft bearing of the fan shaft from spilling into the aircraft’s hot parts. This did not function correctly and we understand that Pratt & Whitney has reverted to a design they know works from their V2500 engine. The final configuration of this rear bearing box will be flight tested at a later date. It shall be pointed out that this part of the engine has nothing to do with the fan gearbox which sits in the forward part of the engine. The FBW testing is focused on failure mode testing after normal mode has been flown to the corner points of the flight envelope, M 0.82 and FL 410. FTV4 has production standard engines fitted, which are at or above spec, Dewar says, and BBD and PW are now conducting aircraft performance testing. FTV5, which finished the installation of a production cabin last week, will now be used for cabin ground tests with full evacuation tests planned before Christmas. FTV5 will the join the flight test fleet after these tests are complete. The wing of FTV1 was repaired according to the CSeries Structural Repair Manual with a carbon fiber plate insert and titanium doublers. BBD has deliberate faults built into their static and fatigue test specimens but they had not planned for repairs of this scale as part of the program. In the end, the repair was a bit simpler to complete than first evaluation let believe. CS300 is identical system wise to a CS100 except for larger wheels and brakes and a modified cargo system. Despite the three month grounding, Dewar says the CS300’s EIS remains about six months behind the CS100. Bombardier has been roundly criticized for not having thousands of orders, comparable with the Airbus A320neo and Boeing 737 MAX families. We’ve addressed this issue on many occasions, noting that all but a tiny portion of the neo and MAX orders are for the A320/321neo and 737-8/9, sectors in which the CSeries does not compete. Bombardier has the majority of the backlog in the 125-149 seat sector, which includes the A319neo and the 737-7. The Embraer E-195 E2 nominally falls in this sector, and so far trails BBD by a wide margin. We expect this to narrow. EMB’s E-Jets dominate the 100-125 seat sector, far outselling the CS100, which BBD characterizes as a niche airplane for hot, high and difficult airports. Figure 1. The Assessment is based on country-risk, carrier stability and, in the case of Republic Holdings, the probability these positions will be resold (but not canceled). Click on image to enlarge. It’s certainly true that BBD has fewer firm orders than many would like: just 243. But its total orders and commitments approach 600. Typically a new airplane program sees about 85% of MOUs, LOIs and Options convert into firm orders. The quality of the backlog, however, is challenging (Figure 1). BBD has been concentrating on developing markets and start-up airlines, a strategy that has the potential for high rewards–but carries with it high risk. The company spent several years working Russia for the Q400, used CRJs and the new CSeries. This was paying off until President Vladimir Putin annexed Crimea and sponsored insurgency in Ukraine. An agreed deal to sell and assemble 100 Q400s in Russia is on hold. 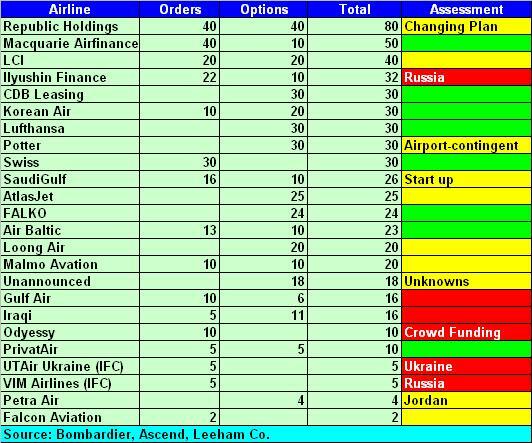 The order by lessor Ilyushin Finance, which already has deals to lease 10 airplanes to airlines in Russia and Ukraine, remains on the books but financing the aircraft is now problematic due to sanctions. IFC is the third largest customer for CSeries. The fourth largest, LCI, doesn’t really know what it wants to do with the airplanes. Its business strategy has shifted to focus more on its helicopter unit. And then there is Republic Airways Holdings, which has an order for 40 CS300s and options for 40 more. These airplanes were ordered with the intent to place them at Frontier Airlines, which has since been sold. Republic’s CEO Bryan Bedford makes more U-Turns than Qatar Airways CEO Akbar Al-Baker or the old flower-picking game, Does she or Does she not? Bedford has repeatedly said he will take the airplanes, or not. We think in the end the positions will be resold, but not canceled. Figure 2. Bombardier’s production slot allocations for firm orders and options, by year. Source: Ascend. Click on image to enlarge. Bombardier is under no illusions. It’s overbooked its delivery schedule with the orders and options (Figure 2). The production ramp up revealed several years ago planned for two per month per year until reaching eight or 10 per month. The delivery schedule demonstrates BBD is overbooked. BBD, as with other OEMs, does this with the expectation that some customers will cancel or defer. In the event BBD is wrong, it has plans to ramp up more quickly, but we don’t have visibility on this potential acceleration. Dewar declined to clarify the ramp-up schedule or whether it will be accelerated to accommodate the over-booking. He confirmed that initial production capacity is 120/yr when the ramp-up is completed. The Canadian investment bank, Desjardins, believes Bombardier can meet its now-planned entry-into-service in October 2015 for the CS100. Source: Dejardins, Nov. 18, 2014, Research note. Click to enlarge. Bombardier set the second half of 2015 as its revised entry-into-service when it announced another delay at the end of 2013. After the engine issue in May this year, resulting in a three-month grounding of the FTV fleet, BBD stuck with this timeline. 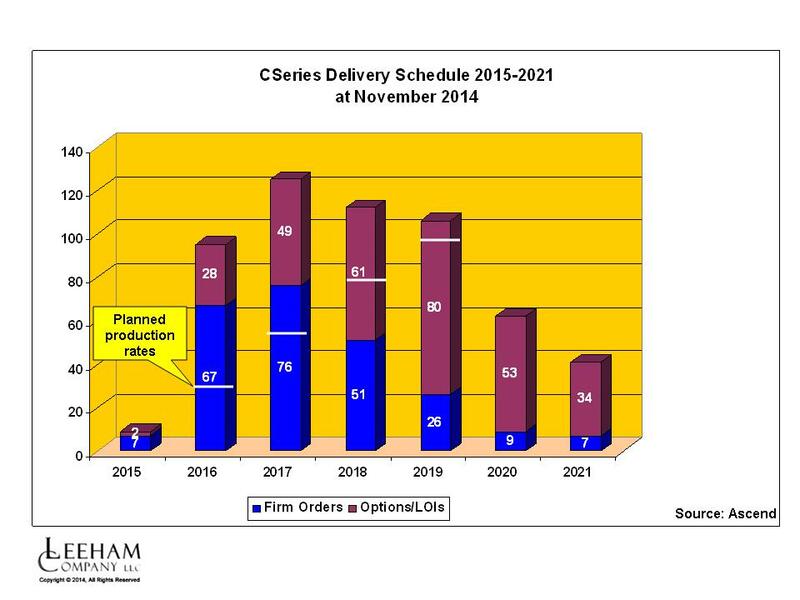 The Canadian investment bank company, Desjardins, calculates that BBD can meet its October EIS (Figure 3). Desjardins writes that the FTVs are now flying 36 hours a month compared with 20 before the grounding. Once all five FTVs are in service, the investment bank believes this will increase to more than 40 hours a month. Looks like the news flow around the Cseries is better now. Some are seeing the light at the end of the tunnel ? No word on weight ? MTU as shown a slide this year with an CS100 range of 3150 Nm +200 NM vs actual “brochure range” ? One more question, as my english is not the best : engine wise : above spec means that fo example fuel burn is higher than planned ? There’s nothing wrong with your English; this is ambiguous. In this case, the results are better than specifications. 1. The weight is under control. 2. The aerodynamic drag remains low. 3. The engine fuel burn is better than expected. October 2015 as EIS date for the CSeries is what was to be expected after maiden flight in mid september 2013. The original flight test programme had been planned to last about 12 months. So the math was easy. But the CSeries was grounded for more than three months. This should normally retard certification and push EIS to at least the beginning of 2016. If Dewar is correct this situation can only be explained by the credit CIASTA is receiving. If so, it would mean that CIASTA will be credited for the equivalent of more than three months of actual flight testing. Hopefully everything will remain on track until certification. But so far Bombardier has not delivered on many of its promises. So I remain both optimistic and skeptical at the same time. “An important point is that FTV3, the lastest aircraft to be reintroduced into flight testing, could be loaded with the production version of the aircraft’s software (including maintenance functionality) with no additions or upgrades planned.” An important point indeed. This would imply that the software has already reached a high degree of maturity. A quick remark about the engine problem that grounded the fleet for an extensive period: an oil containment issue with the aft bearing box sounds more credible than the widely reported “oil seal problem”. Although in the end it’s almost the same, technically speaking. But what worries me is that the final configuration has not yet been implemented. It should not impede on engine certification though, but we won’t find out until a permanent fix is installed on production engines. Thank you for unlocking this CSeries article. Excellent analysis. Interesting assessment regarding orders. 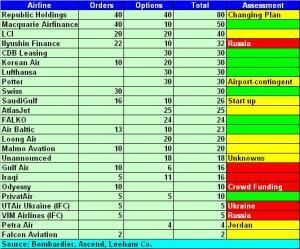 Can I ask why Gulf Air was marked as red? I googled them and they seem to be expanding their routes, etc. Why were they assessed as a high-risk order, I wonder. Gulf Air has had serious financial problems in the recent past. Isn’t Gulf Air fully owned (and backed) by the Bahraini government? If I am not mistaken, Golf Air needs the CSeries to operate to and from London City Airport. If that is indeed the case, I would not consider this acquisition a luxury, but a necessity. If the range of 3150 nm turns out to be correct, the CSeries should be an excellent choice for Gulf Air, able to service all but a handful of the GA destinations, most of which are in Europe, Africa and the Indian subcontinent. Yes the CSeries is definitely the right aircraft for Golf Air. And I believe the rumoured figure of 3,150 nm is only the beginning. For I expect the range of the CSeries to be extended still further in the coming years as improvements are made to the aircraft, and more specifically to the engine. Any inference that a CS 500 is coming? I think that one big problem of Bombardier is negative cash flow. The Q-Series is in difficulties comparatively the ATR-72-600 and the fact that the russian orders is on hold is not helping. Even the CRJ family is not particularly successful and the backlog is significantly lower than the E-Jet E1. Low orders and low production rate will reduced profit margin and Bombardier need money for its Cseries. Furthermore, Bombardier will probably lose money on early CSeries deliveries (Boeing call this deferred production cost). This probably explains why Bombardier cuts its workforce of 1700 employers. A few years ago, Bombardier claimed that the new factory for the CSeries has a capacity of 20 aircrafts/month with possibility to increase its capacity with further financing. Now, Bombardier talk about a capacity of 10 aircrafts/month. It seems that the idea of a second assembly line is on hold for a few years.